Tickets available at SM Tickets and ABS-CBN KTX! Hip-hop has always been a well-known and beloved genre in the world of music. Since its origins from the streets, hip-hop as slowly evolved from simple beats to more EDM styles. And though Pinoy hip-hop was deeply influenced by the American style of hip-hop, Filipino artists have adapted to the new style as well, making it their own, and using it as a medium to tell stories of everyday life—the good, the bad, and everything in between. 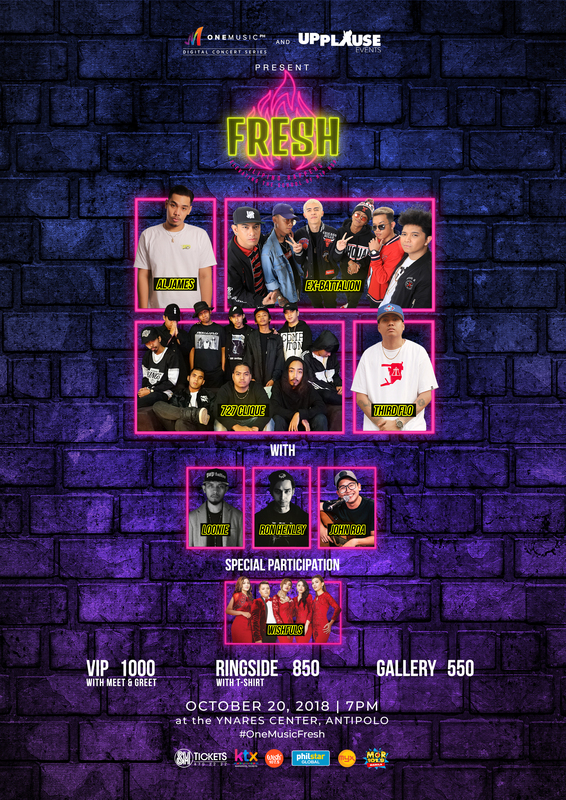 With its rising popularity in the local music scene, One Music PH is proud to present “FRESH: Filipino Rappers Elevating the School of Hip-Hop” The digital concert will take place on October 20, 2018 at the Ynares Center, Antipolo, featuring some of the most up and coming Pinoy rappers of this generation: Al James, 727 Clique, Ex-Battalion, and Third Flo’, with guests Loonie, Ron Henley, John Roa, and special participation by the Wishfuls! With trending singles like “Hayaan Mo Sila” by Ex-B , “Pahinga” by Al James’, “Teritoryo” by Third Flo’, and “Seven Two Seven” by its namesake, 727 Clique, fans can expect these artists to kick it “new school” as they share one stage to represent the urban rap scene. The digital concert will be available online for anyone with an internet connection and a mobile device, much like the previous concerts One Music PH digital concert series.